BMX or Bicycle motocross is either extreme racing on bicycles motocross style - pedal powered bikes instead of motor - or performing tricks and jumps on a bike. Performing tricks on a BMX bike is also known as freestyle BMX. With freestyle BMX there is no clock involved, it is just a test of your skills and creativity. BMX extreme racing involves obstacles for the bikers throughout the race and a start and finish line. BMX bikes are designed for riding in the dirt, doing tricks and motocross cycling. 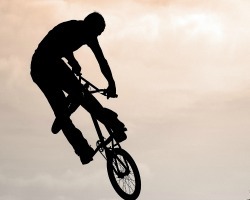 BMX cycling can be dangerous and so it is important to have full insurance cover. It is essential to ensure that your travel insurance policy covers all aspects of your trip and not just your BMX cycling so please read the terms and conditions fully. If you are unhappy with your policy don’t worry. Remember you have a cooling off period of 14 days after you take out any insurance policy. It is a good idea to look around at all the different types of policies out there for example, if you go on a BMX cycling trip more than once a year, it may be better to be an annual policy. If not, a single trip or a single activity policy could be more suitable. Listed below is a policy that offers BMX cycling insurance. It is recommended that you look over the policy details to ensure your individual requirements are met. SportsCover Direct offers single trip or annual multi trip cover for world-wide holidays, this includes cover for activities such as BMX cycling. SportsCover Direct provide an ‘ActivityTopUp’ type of insurance, this means that there is no need to duplicate travel insurance if it doesn’t fully cover your BMX cycling. You can get this activity top up and it will fully cover the BMX cycling. This can be useful when back-packing and for one trip only activities. Due to the high speeds at which BMX cyclists go, the chances of collisions are high, therefore it is important to be wearing the correct safety equipment. For example, helmets and body armour will decrease the chance of causing serious injury to yourself. The most common injuries are breaks and fractures, however, there is also the chance of haemorrhaging and dislocation. When BMX cycling abroad, if you have your own BMX bike, it is a good idea to consider whether to take your own bike or hire one abroad. It is important to take into consideration airline rules on excess baggage if you are flying before making your decision.